South Africa is the ultimate nature paradise. The country boasts a myriad of ecosystems, each with their own unique terrain, animals and plant life, extending from coast to coast. From the lush forests of the Western Cape to the arid deserts of the Karoo, there’s such an abundance of nature settings throughout South Africa to explore. South Africa has an extensive national park system, with 19 distinct parks that reflect the diversity of the landscape and offer something for everyone; wildlife viewing, water activities, bird watching, and mountain climbing amongst many other things. Just about everyone traveling to South Africa knows of Kruger, but many visitors don’t take the time to explore the other national parks. Most of the people you encounter across the country’s national parks are local South Africans, who love nothing more than getting out into nature whenever they have the chance. Exploring South Africa through its national parks is a unique experience. These are often vast expanses of undeveloped and protected land away from the hustle and bustle of city life. Incorporating South Africa’s national parks into our nearly month long road trip throughout the country was one of the best things we did. Here are all of my tips gathered from planning our own trip, as well as an overview of each of South Africa’s national parks. All of South Africa’s national parks offer their own accommodations, allowing you to stay on the premises after everyone else leaves for the day. You have the rare opportunity to be directly in nature, often in near isolation, where it’s impossible not to relax amidst your surroundings. The lodgings vary from park to park but run the gamut from camping to rustic cabins to luxe chalets, and you’ll likely have an option at every budget level, especially in the larger parks. If you’re not camping, you can expect basic but comfortable self-catering accommodations that have everything you would need like towels and kitchen items. 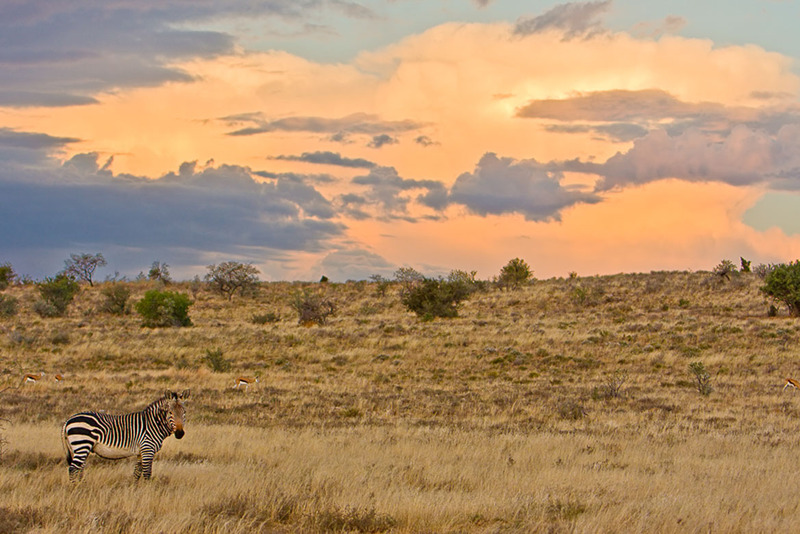 Staying within one of South Africa’s national parks adds a new dimension to your experience. If you opt to stay outside of the national parks, you can visit for the day while the gates are open, often during daylight hours. You must pay a conservation fee to enter but are able to take advantage of most of the activities and excursions while on site. Most of South Africa’s national parks have dedicated picnic spots throughout the grounds, which offer a pleasant and scenic stop when visiting. Each park has its own offerings, though not all of them are ideal for game viewing, particularly in a safari-like setting. Some parks are renowned for their landscape and terrain (Golden Gate Highlands National Park, Karoo National Park, Namaqua National Park), some for their proximity to the ocean (Garden Route National Park, Table Mountain National Park, Agulhas National Park), some for their cultural heritage (Mapungubwe National Park, Mokala National Park), and, of course, some for game viewing (Kruger National Park, Kgalagedi National Park, Addo Elephant National Park). All of the parks offer a range of both free and paid activities that can include hiking, rock climbing, biking, game drives (both guided and self guided), bush walks, boating, swimming, bird watching, horse riding and fishing. A few of the parks have onsite education centres to provide additional context into the history of the area, local culture or the flora and fauna of the region. An additional benefit to staying in one of the national parks is that some offer activities that aren’t available to day visitors, like professional game drives before and after the gates are closed, providing a unique opportunity to view wildlife when they’re most active and away from hundreds of other vehicles. If you’re staying on site, you will likely have access to a kitchen either in your chalet or cottage or in a communal kitchen area. Every place that we stayed within the national parks had its own braai – a charcoal barbecue – that most visitors use to make their meals. Only the larger parks have a shop on site, and when they do they often only have the bare necessities, so it’s a good idea to buy food and a bag of charcoal on your way into the park. A few of the larger parks have an onsite restaurant that you can opt for instead, and some include breakfast when you’re staying on site. Each park has a daily conservation fee that every visitor has to pay, including if you’re staying on the premises. The fee varies by park and ranges from 80 to 328 Rand ($6 to $25 USD) for international visitors, though the price for South Africans can be up to four times less. If you’re planning on visiting several of South Africa’s national parks, consider the Wild Card, which gives access to all parks for a year starting at 2,210 Rand ($164 USD) for an individual, 3,455 Rand ($258 USD) for a couple and 4,130 Rand ($308 USD) for a family. Most national parks require a vehicle to enter and access the grounds. Many of the parks have driving route that take you through various parts of the park and game viewing if applicable, some of which may only be accessibly by 4×4 vehicles so you might want to consider a SUV for your visit. Everything you need to know about South Africa’s national parks are on its website. Here you can learn about the different parks, the animals and plant life in each, accommodation options and even view live webcams from across the parks. The SAN Parks website also allows you to book accommodation online in a fairly easy and straight forward way. A summary of the parks, listed clockwise starting from Johannesburg. Location: Limpopo & Mpumalanga, sprawling from Nelspruit in the south to the Zimbabwe border, along the border of Mozambique. South Africa National Park photos by JP Bervoets and courtesy of Flickr: Ewan, South African Tourism (1, 2, 3, 4, 5, 6), Amanderson2, Bernard DUPONT (1, 2, 3), Darren Glanville, Bradclin Photography, Mike Cilliers.